What’s a girl to do on a reaaaaally slow day? Watch tonnes of YouTube videos and get food inspiration! 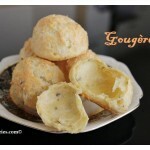 Today I tried my hand at Gougères, a classic French cheese puff. These took me less than 30 mins to make and are really yummy. If you have friends over I suggest you make more than just one batch coz they will disappear before your very eyes.